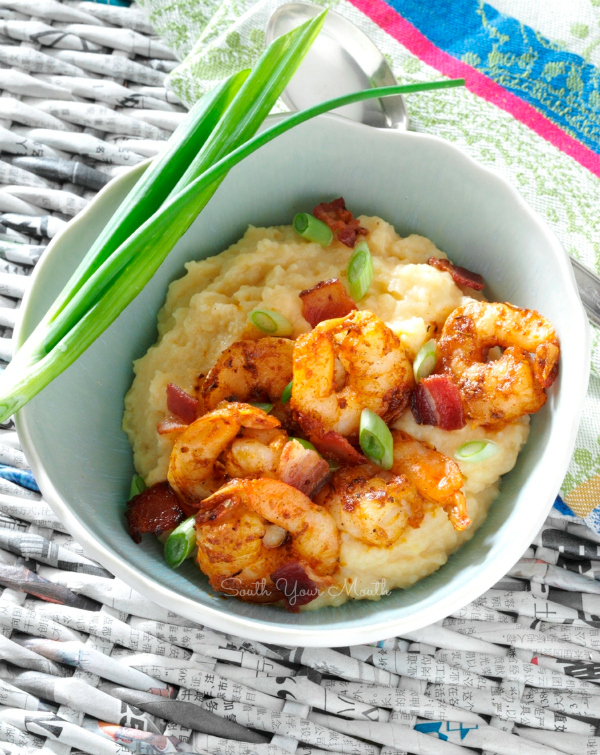 Award-winning Southern Shrimp & Grits recipe with blackened shrimp, bacon and cheese. So, I got home yesterday to find a complimentary copy of Country Woman magazine featuring my Shrimp & Grits recipe. Sa-weet! There are many different ways to prepare this dish. I've had it with a tomato sauce and with red-eye gravy. I’ve had it with the shrimp incorporated into the grits. There’s really no wrong way to cook this. I’m sort of a purist with mine. I just like a rich, creamy bowl of grits with sautéed shrimp and all the pan drippings ladled on top. You can absolutely substitute fish fillets (such as trout, catfish or flounder) for the shrimp and have an equally Southern dish of Fish & Grits. Speaking of Fish & Grits… we occasionally have frozen fish sticks for supper on those nights when every kid has practice and we’re all crazy rushed trying to fly through our evening routine of homework, supper, bath, etc. I’m not sure how it happened but I've started serving grits with them. The onions will chop up their fish sticks and stir them up in their grits and of course, douse the whole thing with hot sauce. We’re so country. Combine chicken broth, milk, butter, salt and pepper in a large saucepan and bring to a boil over high heat. Whisk in grits, reduce heat to low, cover tightly and simmer for 1 hour, whisking every 10-15 minutes. Add cheese and stir until thoroughly incorporated. Set aside and keep warm until ready to serve. Toss shrimp with hot sauce and Cajun or Blackening seasoning and set aside. Sauté bacon in a large skillet over medium-high heat until browned and crisp. Add garlic and shrimp and sauté until shrimp turn pink (about 3-5 minutes). To serve, ladle grits into a bowl** and top with shrimp mixture. Garnish with chopped green onions. *I like Texas Pete but I’ve heard that Franks is almost as good if you can’t find it. **If the grits have thickened up too much for your liking (I be liking mine very smooth), just whisk in a bit of warm milk. I don't think you're allowed to call yourself Southern if you don't like shrimp and grits! This looks wonderful, and I love it spicy! Ps. I like Frank's better ;-) To each his own. Shrimp and Grits is one of my all time favorites. Instead of bacon (which is good) I like using country ham or andouille. Maybe I missed it somewhere. How many servings for this recipe? I guess there are about 4-5 servings in this recipe. Do not use corn meal. You can buy "grits". If you can not find them in the store you may have to order them online. Don't get quick grits you need the ones that cook for a long time. Give them a try, my ex is a Yankee and he loved them. Good luck! Since I'm Italian ... what do you think about polenta, I make a garlic shrimp and polenta and it's yummy. Do you drain out the bacon grease before adding shrimp etc.? Nope :) You need that greasy goodness to saute the shrimp and flavor everything up. it seems like a lot of grease. I wasn't sure if I should drain all but a couple tablespoons? As long as you have enough to cook the shrimp, you can drain some of it if you prefer. Most Shrimp n Grits dishes I've had have some type of spicy sauce served around the edge of the grits. What would you recommend? Could you use the bacon drippings and hot sauce? Texas Pete is the favorite here in eastern NC. Thanks! Just to follow up, I did not end up draining any of the bacon grease. The meal was delicious! Definitely a keeper -thank you! There is a restaurant in town that uses parmesan cheese instead of cheddar cheese in their Shrimp and Grits. If you really want the best shrimp and grits. Plan a vacation to Charleston, South Carolina. Were it was invented!!!!!!!!!!!!!! WOW! This dish was so good! I doubled it and the leftovers were even better. Thank you! I'm really excited to try to cook grits! I'm a Pacific Northwesterner and we rarely see grits anywhere but I have had delicious grits on a couple of vacations. (My aunt is a southern transplant, we gain like 10 pounds when we visit her in Mississippi). I tried quick grits one time and yeah...not good! Oh my Lord - this is good! This was my first time to make Shrimp and Grits (and I'm old and from the South...) and it won't be my last time! My husband was moving his feet underneath the table - that means he REALLY liked it! Thanks for a great recipe! Blessings to you! This looks so good in the picture at the top of the website's home page. Every time I come here for a recipe I think I need to try it. My husband and daughter are not big on spicy food. Is this super-spicy with the hot sauce, or just flavorful? I realize that "spiciness" is a pretty subjective thing, but if you could help me out a bit on the spiciness level that would be great... Before I make a meal that no one else will eat! I chose to serve this recipe for the Super Bowl. It did not disappoint. It was extremely quick and easy to prepare and got rave reviews. I rarely follow a recipe to the letter. I did this time and it was perfection. I was reserved with the hot sauce and Cajun seasoning but offered additional for each person to choose to add. Next time, I will just be generous because as written, it is not too much at all! I have made several of your recipes and loved each one. However, this one, I will serve often. It is a definite winner. I made this last night and Oh my gosh was it a hit at my house!! Everyone was raving about the textures and how balanced it was- it was just an excellent dish all the way around. As I do not like to use bacon when I cook- I figured there was enough protein and fat given the ingredients. So I added a little bit of paprika and cayenne to the shrimp as I was cooking to give it that smoky flavor you get from bacon. Otherwise, I followed the recipe to a T and oh my has it been delicious. Thank you for sharing!! Eight months pregnant and tired, I had no idea what I was going to cook for tonight's football game. Southern Plate keeps sharing your recipes, so I thought I would try one. This one looked easy and delicious. It was everything I hoped! My husband raved about the food. It will definitely be a regular on our menu! Thanks for sharing it! I look forward to trying more of your recipes. Cabbage stew is on the menu for tomorrow. Just wanted to say I fixed this for the Mississippi man one evening---he said it was the best shrimp and grits he ever had! I did add some grated Parmesan to the grits for an extra dimension of flavor. It's just the best recipe and so easy to prepare. Thanks for a keeper! I discovered this mouth-watering recipe last year thanks to Christy Jordan's Southern Plate. My husband loves it and requests it often during football season as one of his favorite game day meals. I just wanted to share that last night he had shrimp and grits at our local country club. The chef is an amazing cook, but my husband said my shrimp and grits (this recipe) was so much better! Thanks for helping me shine in my husband's eyes! That might be the nicest thing anyone's ever said to me!! Give your husband a big ol' hug from me! Thank you! I believe it was invented in Georgetown,S.C.